Sweet, sturdy board books describe Miffy's adventures in which she finds wonder in the everyday. 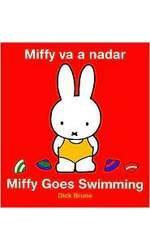 In Miffy Goes Swimming it's a sunny day and Miffy gets on a swing to stay cool. She finds swimming is the best way to enjoy a hot day!